Having already been tainted by the DC Madam scandal and an airport dust-up, will Sen. David Vitter do something else to score the hat trick of political infamy? Historically, brothels and bars are the places where members of Congress get caught in compromising situations that can be hard to explain to the voters back home. But in the modern era, there’s a new danger zone: boarding areas. Increasingly, airports spell trouble for politicians, with Sen. David Vitter’s recent dust-up at Dulles International Airport just the latest in a string of incidents involving luggage-toting lawmakers. Andrew R. Thomas, an assistant professor at the University of Akron with expertise in air rage, isn’t surprised that federal officeholders foment their discontent in the plane domain. “It really is based upon folks who feel they’re entitled based on their position,” says Thomas, who notes that athletes, supermodels and rap stars have also found the airport a particularly precarious place to be. On the one hand, any frequent traveler can empathize with the frustrations — long lines, unexplained delays, and seemingly indifferent security and airline personnel — that cause lawmakers to boil over. But it still makes for terrible press. Vitter’s reputation has already taken a bordello beating, with the Louisiana Republican having admitted to a “very serious sin” involving the “D.C. Madam” prostitution scandal. 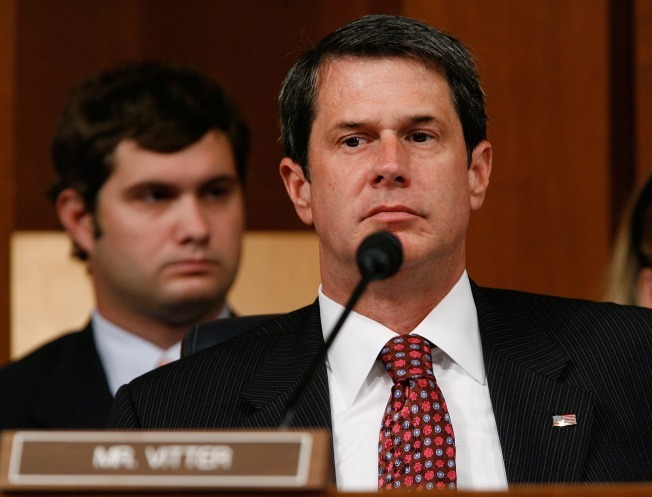 So it certainly didn’t help when the Transportation Security Administration announced last week that it would review a report that Vitter had gotten into a spat with an airport employee after missing his flight home. By reputation, the most demonstrative traveler in Congress these days might be Rep. Sheila Jackson Lee (D-Texas), whose turbulent relationship with the airlines has added to her notoriety. A 1998 story in the Houston press reported that the congresswoman’s air-travel antics included an episode in which she screamed at Continental Airlines workers after learning that her usual food order was not available. Another time, according to The Weekly Standard, the congresswoman demanded that a flight out of Ronald Reagan Washington National Airport return to the gate so she could search for a misplaced purse. Rep. Patrick J. Kennedy (D-R.I.) once got into it with a security guard at Los Angeles International Airport. Police who reviewed a video of the incident said there appeared to be some physical contact between the congressman and the airport worker, who alleged that Kennedy grabbed her and swore at her when she told him his bag would not fit into the X-ray machine. In 2007, Rep. Bob Filner (D-Calif.) was accused of muscling his way past a baggage worker in an attempt to enter an unauthorized area at Dulles. Filner, who was initially charged with assault and battery, denied hitting or pushing anyone or seeking “any sort of special treatment because I was a congressman,” but he later paid a fine and was forced to apologize to the worker. It wasn’t exactly an “air rage” moment, but Sen. Charles Schumer (D-N.Y.) reportedly pulled rank with U.S. Airways after the airline delayed the shuttle flight he was planning to take. The Washington Post reported in January that Schumer — who’s been a vocal critic of flight delays in his home state — persuaded officials to allow the next flight from LaGuardia Airport to D.C. to depart the gate 16 minutes early, so that he could get back to Washington in time to make a vote. However, Rep. Peter DeFazio (D-Ore.), who serves on both the House Transportation and Infrastructure Committee and the House Homeland Security Committee, says that members are getting less and less in the way of special treatment. In 2007, the Senate Ethics Committee ruled that a long-standing tradition of airlines allowing members to book multiple flights for the same day without penalty did not violate the new gift ban. But once lawmakers enter the airport, they often face the same prospects that the rest of the citizenry faces. DeFazio recalls an incident he had in the wake of the 2005 London bombings, when an agent barred him from taking a 1-ounce bottle of prescription eye drops through the security checkpoint. The congressman says he didn’t feel it necessary to mention that he was a congressman — “What would that do?” he asks — but he did put in a call into then-TSA Administrator Kip Hawley. He reminds lawmakers that it was a breakdown on Sept. 11, 2001, that led to the deaths of thousands of Americans.